Pumpkin Spice Donut Holes Recipe - Pumpkin spice recipes are always fantastic to taste, follow these recipe instruction to cook pumpkin spice donut holes. Here is what you'll need Pumpkin Spice Donut Holes to Serve 8-10 peoples. 1. 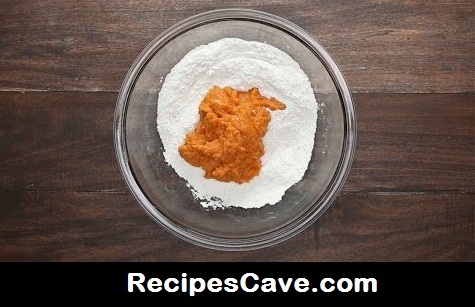 In a large bowl, mix together flour, sugar, baking powder, pumpkin pie spice, and salt. In a separate bowl, mix together pumpkin puree, egg, and butter. 2. Pour wet mixture into dry mixture and stir together with rubber spatula until fully incorporated. Set aside. 3. Heat oil in a frying pan to 325˚F/160˚C. 4. While oil is heating, use your hands to shape and roll the pumpkin donut dough into balls. (Greasing your hands with oil will make this process much easier). 5. Fry the dough balls until golden brown, about 4-5 minutes. (For best results, fry only 3-4 at a time). 6. Drain them on a paper towel and immediately transfer to bowl of the pumpkin pie spice-sugar mix. Gently toss to coat. *Note: Make your own pumpkin pie spice by mixing 2 tablespoons cinnamon, 1 tablespoon ginger, 1 tablespoon nutmeg, and ½ tablespoon cloves; use 2 teaspoons in the dough, and 3 tablespoons in the topping mixture. Your Pumpkin Spice Donut Holes Recipe is ready to eat.